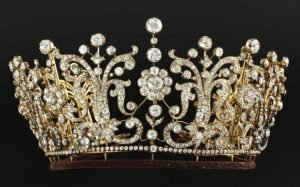 Here’s a list of my top ten favorite antique tiaras pictured on the internet. They are listed in no particular order, though I am partial to the Strathmore Rose. Which one is your favorite? 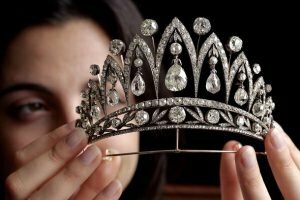 Is there an antique tiara, famous or not, that I missed? Be sure to comment and link to your favorites below. 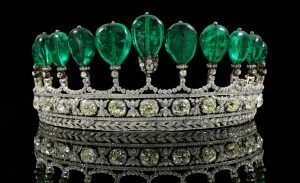 What I miss here are some of the Imperial Russian jewels. 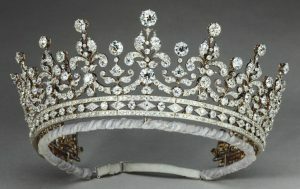 The huge catalog book is possibly unavailable now, but included some striking tiaras. One in particular sticks in my mind: a really beautifully executed gold and diamond symmetrical stalks of wheat item. The book was published in the early ’70s, and was at least 600 pages. 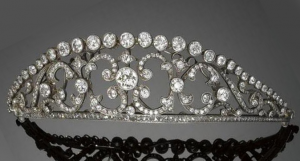 It’s really interesting to see different designer’s ideas of what a tiara should look like. 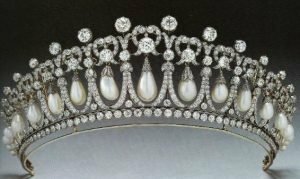 Colored jewels vs white diamonds, intricate vs linear designs, use of pearls, etc. They’re all beautiful in their own way, even though they vary so widely! 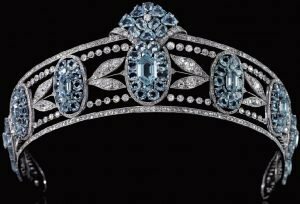 What was the name of the book with the Russina Imperial jewels? Would like to see if i can’t get my hands on a copy. The circlets and tiaras created for the movie series The Lord of the Rings are really lovely, though not antique. 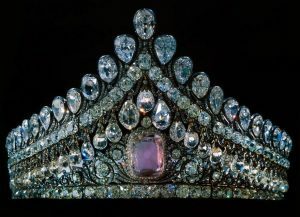 Lovely, and I particularly like the photo of the Spanish tiara – that’s the clearest image I’ve seen of that one, I think. 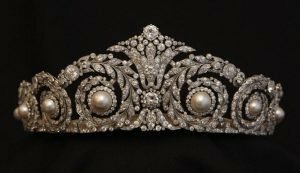 Russia to be used by Faberge’s workmen to make this tiara.